In this exercise we simulate a use case of receiving samples over the counter, without the ARs being registered before. This workflow is most prevalent in regulatory environments where lab clients register their Samples firstly with regulatory systems such as METRC and interfacing these systems is not yet possible. Cannabis ARs can contain more than 100 Analyses, and the the system here is configured to do a lot of processing in the background for performance reasons, could still be optimised further. Only recommended for 5 or fewer Samples to prevent the AR Create form becoming unmanageably large. 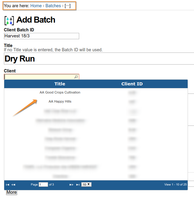 Select a Batch date, and if applicable which Batch sub-groups to apply. This feature is used by Clients, e.g. Cultivators, to track say analytes over a season to optimise growth and harvesting by continually adding Samples to the same Batch, corresponding to their cultivation or production batches. The results will be categorised using these labels in the Batchbook view. 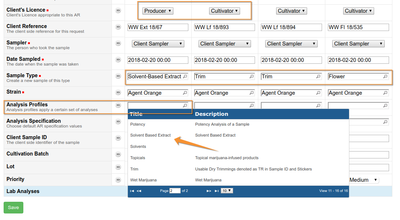 The Remarks field is handy for capturing ancillary information from the Client and Lab observations to assist in handling queries. Press Save. The Batch's AR Page opens. Compulsory fields are indicated with red icons and look-ups are provided for most of them. Creating these big ARs through the UI generally takes less than a minute per AR, In this time the lab clerk may continue with creating the next Batch or other tasks.